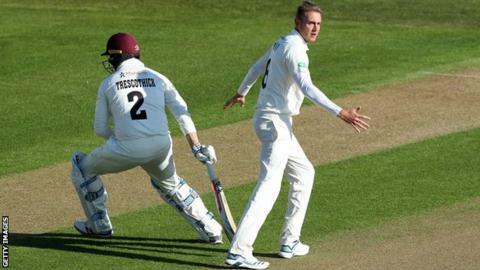 Lewis Gregory's six-wicket haul against Nottinghamshire gave Somerset the upper hand on a tough first day for batsmen. Gregory's 6-68 helped dismiss the hosts for 263 at Trent Bridge, before England's Stuart Broad struck twice late on in a day when 13 wickets fell. Somerset trailed by 189 at stumps, closing on 74-3, after Gregory had built on his fine start to 2019 when he took eight wickets against Kent. Chris Nash and Luke Wood both made half-centuries for Notts. Nash's 51-run second-wicket stand with Ben Slater (24) steadied the hosts after the loss of Ben Duckett (0) to Jack Brooks with the eighth ball of the match. Nash also added 52 for the fourth wicket with captain Steven Mullaney before becoming the third victim of the day for Gregory, who now has 14 wickets in three Championship innings this summer, at an average of 7.80. The England Lions all-rounder claimed 3-26 in the first innings and 5-18 in the second when Somerset opened their campaign with their 74-run victory over Kent. Wood and wicketkeeper Tom Moores (47) added 46 for Notts' seventh wicket before Gregory and Craig Overton (2-48) saw off the tail. Broad then accounted for Somerset openers Marcus Trescothick and Azhar Ali as the visitors slipped to 36-3 before Tom Abell (22 not out) and George Bartlett steered them to the close with no further damage. "It's pretty evenly poised after a really good day of cricket, played on a good wicket with a quick outfield and in front of a good crowd. "There were times in our innings when we were just about there to go on and build a big partnership and a substantial score but we kept losing wickets, so all credit to them and to Lewis Gregory for the way he bowled. "But then they were three big wickets for us to take. Stuart Broad bowled beautifully for all eight overs and could have had three or four wickets." "Obviously any day where you succeed and take some wickets or score some runs is a good day to be a cricketer, so this is pretty special. "I'm on a roll at the moment but I'm sure that, in the not-to-distant future, there'll be a couple of 'none-for 100s' which will swing it the other way. "I know Joe Clarke well, after playing a little bit with him over the last couple of winters. It's always nice to get him out because he's a ridiculous talent. His record speaks for itself."